Fancy England to win their third World Cup match against Belgium on Thursday? Coral are offering a monster price on the Three Lions to beat Belgium! Claim here a massive 66/1 England to win + £5 free bet if he doesn't! England have scored eight goals and conceded three. They are level on points with Belgium and this clash will decide which team wil top the group. Don't miss the chance to make a £66 profit by staking just £1 on England to get all three pointsl! UK+IRE New Customers Only. Winning bets paid in cash based on the normal price on our website. Enhanced odds paid in free bets. Free bets valid for 4 days. Free bet stake not returned. 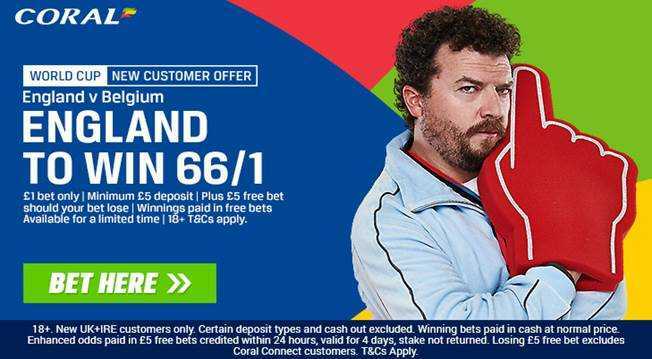 Coral offer 66/1 England to win vs Belgium + £5 free bet! Open a new account with Coral before the kick-off (7.00pm UK Time) and claim 66/1 England to beat Belgium in their final 2018 FIFA World Cup group stage match - What a huge price! If Kane finds the back of the net, Coral will settle your bet at the original price immediately. They will top up your additional winnings within 24 hours. Should your bet lose, Coral will refund you with a £5 free bet! Ladbrokes offer 50/1 for Harry Kane to score a goal during England vs Belgium + £5 if you lose! 18+. UK+IRE New Customers Only. Available for a limited time. Min deposit £5. Winning bets paid in cash based on the normal price on website. Enhanced odds paid in free bets. Free Bets valid for 4 day. T&Cs apply. Get 60/1 England to beat Belgium with Betfair! + up to £100 in free bets! New Customers can get Egland at an enhanced 60/1 to beat Belgium. Max Stake £1. Winnings paid in free bets, valid for 7 days, only deposits with cards/Paypal count. Exchange and multiple bets excluded. T&C’s Apply. 18+|Gamble Aware. Get 60/1 England to beat Belgium with Paddy Power! New Customers can get England at an enhanced 60/1 to beat Belgium. Max Stake £1. Winnings paid in free bets, valid for 7 days, only deposits with cards/Paypal count. Exchange and multiple bets excluded. T&C’s Apply. 18+|Gamble Aware. + £5 free bet if they don't! New Customers can get Brazil at an enhanced 25/1 to beat Costa Rica. Max Stake £1. Winnings paid in free bets, valid for 7 days, only deposits with cards/Paypal count. Exchange and multiple bets excluded. T&C’s Apply. 18+|Gamble Aware. England have recorded back to back win in their first two World Cup matches, beating 2-1 Tunisia and 6-1 Panama so far. Harru Kane is on fire and currently the top scorer of the competition with 5 goals. The most recent direct encounter between these two teams took place six years ago with England winning 1-0 at Wembley thanks to a goal from Danny Welbeck. Belgium have shown frailties in defense, conceiding two goals against Tunisia. England is normally backable at 9/5, unless you claim this offer. Coral are offering all BetAndSkill readers a monster price of 66/1 England to win vs Belgium, click here to get your unmissable boost in few simple steps! Maximum bet at enhanced odds is €/£1. Exceeding stake will be paid at normal odds (in cash). Free Bets are valid for 4 days. Should you lose your qualifying bet, Coral will reward you with a £5 free bet as a refund. Payments restrictions apply. Eg. Deposit methods such as Moneybookers, Paysafe, Neteller and Skrill do not count towards this price boost offer. "66/1 England to beat Belgium + £5 free bet at Coral"